My Water Quality: Is our water safe to drink? Most Californians receive their drinking water from public water systems. These systems are subject to many state and federal regulations intended to ensure that the water the systems provide to their customers is safe. On this page you can find links to information about the quality of your drinking water, as well as information about the regulating agencies that oversee public water systems. There's also information for private well owners. The U.S. Environmental Protection Agency (U.S. EPA) administers the federal Safe Drinking Water Act and adopts regulations to implement the Act. However, the U.S. EPA grants primary enforcement responsibility for the federal act and regulations to those states that meet certain criteria. 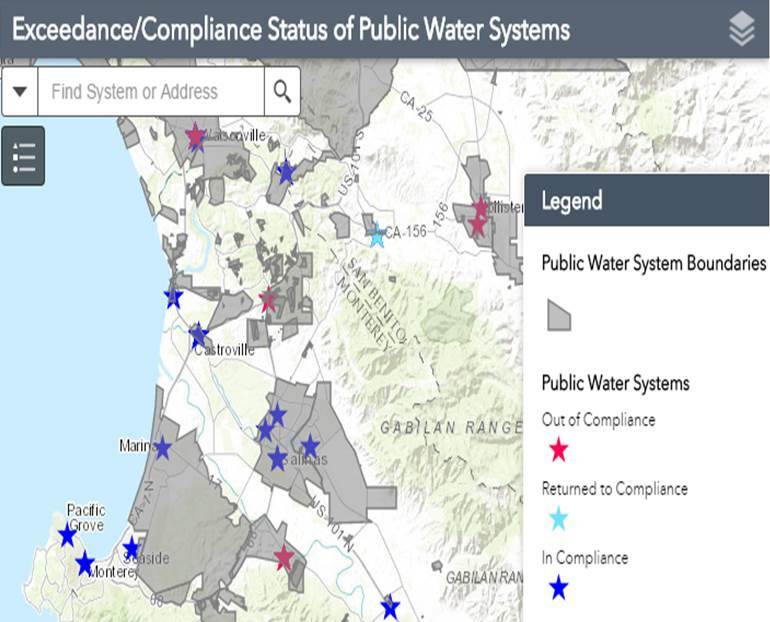 Division of Drinking Water (DDW) has been granted primary enforcement responsibility by U.S. EPA for public water systems in California and is also responsible for regulating public water systems, under the state Safe Drinking Water Act. DDW also is responsible for developing regulations for the use of recycled water to supplement drinking water supplies. 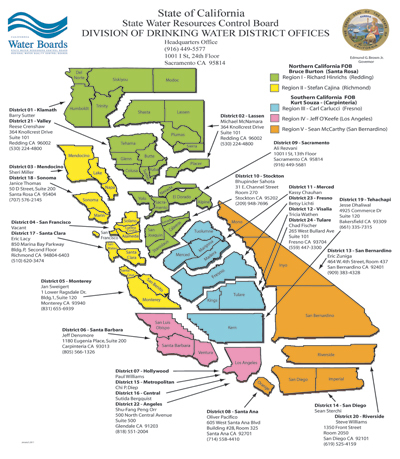 Click on the map below to find your Division of Drinking Water district office. Some smaller public water systems are regulated by County Environmental Health Departments. These are called "Local Primacy Agencies." Some even smaller water systems, called state small water systems, are subject to minimum requirements that are enforced by local health agencies. 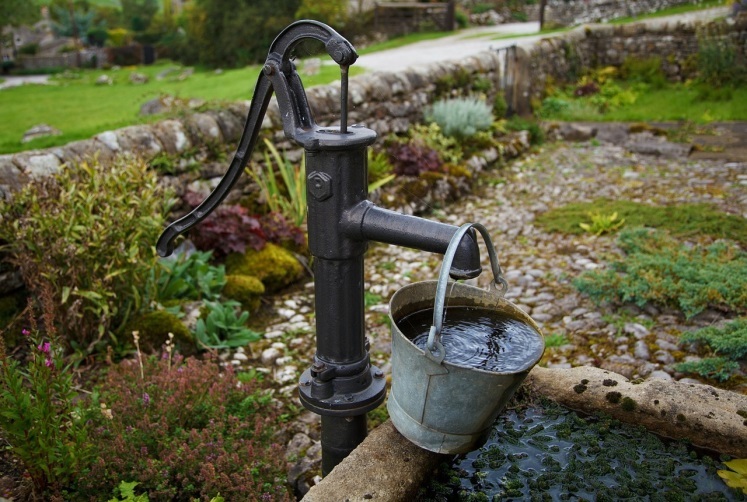 Some people get their drinking water from wells or other sources that do not meet the definition of a public water system or a state small water system because they serve a small number of people, or perhaps only one household.Those wells and small systems are not regulated by the State in terms of drinking water quality. To assist well owners, the State Water Board has prepared A Guide for Private Domestic Well Owners. The Groundwater Ambient Monitoring and Assessment Program (GAMA) has information for private well owners. 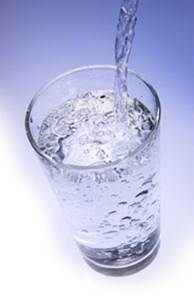 For more information about water quality for private wells, contact your county's environmental health department. The State Water Board is responsible for adopting drinking water standards, including standards for contaminants, which are called Maximum Contaminant Levels (MCLs). The State Water Board is required to set the MCL at a level as close to the Public Health Goal (PHG) for that contaminant as is technologically and economically feasible, placing primary emphasis on the protection of public health. PHGs identify concentrations in drinking water that pose no significant health risk and are established by the Office of Environmental Health Hazard Assessment (OEHHA), which is part of the California Environmental Protection Agency. At the Human Right to Water Portal, you can find information about your drinking water system's water quality. There are also maps, links to compliance data, frequently asked questions, and access to the Drinking Water Watch website. If you receive your water from a public water system, the water system is required to provide to you an annual Consumer Confidence Report (CCR), which contains information about the system's water quality. Contact your water supplier for questions about the CCR. A number of CCRs are available at the Drinking Water Watch website.